It was fantastic to watch such an exciting competition and an honour to host it.....we look forward to welcoming lots of these competitors back in the Autumn! In the meantime, best of luck to the CCI’s, who showjump tomorrow! 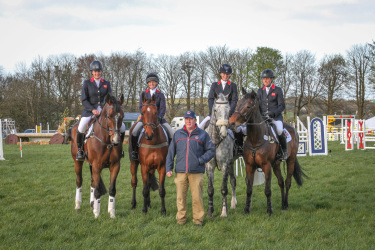 For full results of today’s action, hit the button below but in summary…..
Oliver Townend took the title after a great cross country round today with Cooley Master Class. Izzy Taylor (Allercombe Ellie) and Geoffroy Soullez (Madiran Du Liot) each picked up 0.4 time penalties so remained in 2nd and 3rd place respectively. Our top 3 here all went clear within the time today, so our overnight placings remain the same. Oliver Townend (Shearwater) has a fence in hand going into tomorrow (41.9). Jodie O’Keeffe finished in 2nd place today, with Kachemire Le Beau (42.2). Elizabeth Power, with HSS Comporta Beach moved into the top spot as she was just that bit closer to the optimum time. It was a good few days for Elizabeth, who also took 3rd place on Zazoe! The top 5 riders all went clear within the time, so the honours here went to Alison Holden and Maximus Orielius, who finished on their dressage score of 43.2. Second place went to Heidi Hamilton, with Dam Easy and 3rd position was filled by Ciaran Glynn and Best News. Well done all! We hope you all enjoyed the weekend as much as we did and we'll see you in September!